Wolfgang Krauser von Stroheim (ヴォルフガング・クラウザー・フォン・シュトロハイム) (more commonly known as Wolfgang Krauser or simply Krauser) is the German half-brother of Southtowns king of crime Geese Howard. After he was defeated by Terry Bogard in Fatal Fury 2, nothing was heard from Krauser until the The King of Fighters '96 tournament, when Krauser joined forces with Geese Howard and Mr.Big to create the Boss Team. 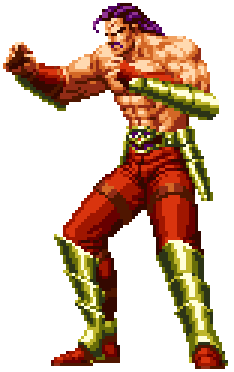 Although Geese used both him and Mr. Big as pawns in his attempt to nab an ancient power called Orochi, Krauser only cared about self-improvement as his aim was mainly to fight stronger opponents. After knowing his mistakes at the hands of Terry, Krauser vowed only to fight stronger opponents in order to restore the strength he once had prior to meeting up with Terry, and to eventually regain his title back from Terry one day, but for now, Krauser wants to improve himself first. This page was last edited on 18 January 2009, at 17:42.